Apparently restricted to shingle beaches in the south-east, the species has been recorded from Blakeney Point, East Norfolk; Orford Beach and Shingle Street, East Suffolk; Colne Point and Walton Naze, North Essex; Bradwell, South Essex; Lydd Ranges and near Faversham, East Kent; and Rye Harbour, East Sussex, all since 1953. P. obsoleta occurs among tide litter, in empty whelk shells and in the open on shingle. Adults of both sexes are found from April to June and from August to October. UK Biodiversity Action Plan priority species. 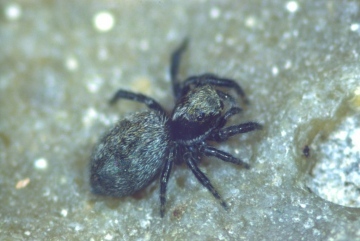 The spider is numerous at some sites, for example Bradwell, Colne Point and Shingle Street. Public pressure, causing erosion by trampling, may degrade its sites and holiday development may be a threat outside nature reserves. The use of vehicles on shingle, as at Lydd Ranges, causes irreversible disruption to the habitat. Shingle erosion may also be a threat. Protection of important shingle sites from exploitation for gravel and excessive damage by vehicles is needed.